Australia was the first country in the world to introduce mandatory plain packaging for tobacco products - and the UK will have followed suit by May this year. But will any country copy Australia's plan to keep increasing taxes until a packet of cigarettes costs AUD$40 (£24)? It's not easy being a smoker in Australia. The smoking bans started inside - in workplaces, bars and restaurants - and moved out. "Smokers would congregate on footpaths and near public transport creating clouds of smoke - what we call 'smoking hotspots'," says Mark Driver, Sydney's Park and Recreation Planner. "Now, smoking is prohibited within 10m (33ft) of a playground, within 4m (13ft) of the entrance to a public building, at rail platforms, taxi ranks and bus stops." Those are the rules in New South Wales, but they are mirrored in many other states. Smoking is banned on many beaches, and most Australian states have now banned cigarettes in jail. All states ban smoking in vehicles if children are present. 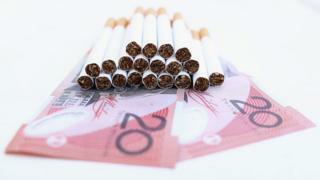 Fines vary, but in some places you may be fined AUD$2,000 (£1,210) if you smoke in the wrong place. And even if you don't, you'll be paying more than that each year by 2020, if you smoke just one AUD$40 pack a week. It's already five years since Australia became the first place in the world to make plain cigarette packaging compulsory. Tobacco-advertising has long been banned, and now branding has too. The boxes are a drab, dark brown colour (deemed the ugliest in the world by a team of Australian researchers), they carry no logos, and graphic health warnings cover most of the front of the box. "You see this gigantic, see-and-never-forget kind of image of throat cancer - a hole in the neck, or what a stroke looks like with a brain sliced open," Chapman explains. "Some smokers say they don't even look at it, but there has been research which shows that with the people who engage in those avoidance strategies, it's actually a predictor of them quitting later on." All this came on top of anti-smoking campaigns that have been driving down smoking rates in Australia since the 1970s. "It's a toxic, poisonous mix of substances, including ammonia, the bleach in toilet cleaner; acetone, the chemical in nail polish remover; benzene, found in paint stripper; and hydrogen cyanide, used in rat poison," went one advertisement. "And smoking delivers it straight to your body." "The evidence shows that these hard-hitting, graphic ads that really show the harms of smoking are some of the most effective," says Scott Walsberger, head of tobacco control at Cancer Council NSW. But other campaigns have also tried a gentler approach, emphasising how quickly a smoker's health starts to improve once he or she has quit. It was this approach that was taken by the creators of an interactive, behavioural change app called My Quit Buddy, launched in 2012. Offering tips for giving up, daily motivational messages, distractions to overcome cravings, and a place to share success stories and celebrate milestones, it has now been downloaded more than 400,000 times in Australia alone. In a world where a lot is going wrong, there is also a lot going right. So, what if you could build a country with policies that actually worked, by homing in on ideas from around the world that have been truly successful? "It shows people that just by even quitting for five days, you can start to see changes - you'll have more money in your wallet, your skin becomes clearer," says Paul Den, one of My Quit Buddy's creators. "And the community forum shows people that they're not alone - people generally trust other people more than they trust the government." The cumulative effect of these policies is that smoking rates for adults have almost halved since 1980, says Henrietta Moore, of the Institute for Global Prosperity at University College, London, and are now at about 13%, compared to a global average of about 20%. There has also been a decrease of almost 23% in the rate of hospital admissions caused by smoking. Simone Dennis, an associate professor at Australian National University, says a culture of shame surrounding smoking has begun to emerge, and that itself has become a smoking deterrent. Take, for example, the policy of confining smokers to areas where they will not create a public nuisance. "If you think about smoking in public, those tend to be spaces that no-one wants to hang out in anyway," she says. "So smokers feel marginalised because they can't be citizens in public spaces any more, because they're restricted to these kind of 'dirty spaces.'" These days, smoking is often taken up by people who are on the lowest rungs of the socio-economic ladder, she points out, "and that adds a burden of shame to people who might already be marginalised". If it's the poor who are now the most likely to smoke, it's hard to see how they will ever afford the AUD$40 pack of cigarettes. Join the conversation - find the BBC World Service on Facebook and Twitter.